Georgia : When and where to go? The climate undergoes two types of influences: subtropical in the west, and Mediterranean in the east. Along the Black Sea, there is strong humidity and abundant rainfall, with average temperatures of 5 ° C in winter and 22 ° C in summer. Continue your exploration by discovering the province of Svaneti, with its authentic villages, high peaks, and stone towers where the villagers took refuge in case of war. It also has a multitude of churches decorated with frescoes and very ancient icons, and it has preserved centuries-old traditions. You can go hiking, climbing, in the middle of thick forests. Then visit Vardzia, a troglodyte town, whose fortifications date from the 12th century, and which was considered a holy city because of its monastery formerly populated by 2000 monks. Its houses in the rocks form a true labyrinth, with 119 sets of caves, including 13 churches. Do not miss the 300 km of coasts on the Moire Sea, with their sandy beaches, and in particular the town of Batumi and its pebble beach. For mountain enthusiasts, Touchétie, in the north-east of the country, is ideal for hiking, whether on foot or on horseback. The environment is still very wild and it is reached by a single road after crossing the pass of Abano at almost 3000 meters. You will admire a sumptuous landscape of snow-capped peaks and deep gorges, and you can even practice skiing in the resort of Bakuriani. EU citizens can enter Georgia and stay 90 days without a visa. The current currency is the Georgian lari, or GEL. No need to walk with your credit card, there are no distributors and few businesses take it in payment. Budget, you can stay for less than 20 € per night and eat for 5 or 6 €: it is really a cheap destination. You will reach Tbilisi airport less than 20 km from the city center, which can be reached by taxi or by bus. To move around the country, it is a bit complicated: buses are frequent but slow and uncomfortable, the roads are in poor condition. In Tbilisi you will find a subway and trolleybuses, but the taxi is the most convenient. With regard to health, it is recommended to have up to date their standard vaccinations and to add to it the one against rabies and hepatitis A and B. Attention to tap water that is not potable. Peel the fruits and vegetables. 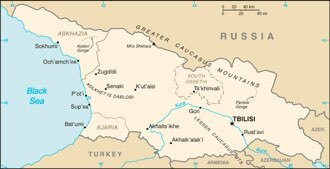 It is advisable to avoid the provinces of South Ossetia and Abkhazia because of the consequences of the conflict between the separatists and the state. Also, do not carry any medicine containing opiates (Daffalgan Codéiné style) that are considered narcotics and entail jail and fine.